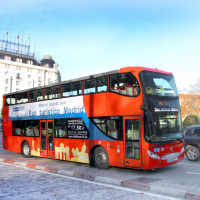 This tour, now operated by the Empresa Municipal de Transportes (EMT - the Municipal Transport Company) offers you a special view of Madrid, onboard the this double-decker tour bus that takes you on a scheduled panoramic tour of Madrid on two possible routes. This is a great way to see the city's fantastic monuments and sights, allowing you to get a good overall view of Madrid, with the flexibility to hop-off the bus to further explore any attractions you particularly like. And then you can hop-on again to continue your tour as the next bus comes round! You can hop on and off the bus as many times as you like on either of the routes, or even start one route, and join another at one of the interconnecting stops. The routes are; Modern Madrid and Historic Madrid (see below). The top deck of the bus allows you to enjoy marvellous views of Madrid's main monuments and sights. Once on the bus, you are given headphones that allow you to listen to the ongoing commentary which supplies tourist information about the sights in 8 languages. The buses are equipped with a low floor for handicapped access, and have a special ramp for those with reduced mobility. 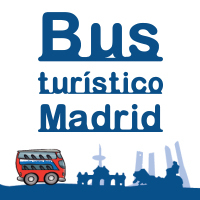 All passengers are given a map of Madrid, showing the city's main attractions and the different tourist routes and also discount vouchers for visiting museums, monuments, attractions and restaurants. The average journey time is 75 minutes if you take the complete route (tickets are valid for any route) and the bus operates every day throughout the year, except for 1st January and 18 September. Operating hours are from 09.30am to midnight in summer, 10am to 7pm in winter and 10am to 9pm in Spring and Autumn. Buses will pass by any stop approximately every 20 minutes. This really is an excellent option to get to know Madrid's sights and monuments in a short period of time. You can then hop-off the bus and explore anything that takes your interest in a more leisurely fashion. · Children up to the age of 6.